Chicago — The Illinois Section of the American Society of Civil Engineers (ASCE) announced the following 2017 award winners. A dream 20 years in the making has been realized with the opening of the Chicago Riverwalk, linking the Lakefront to the West Loop along the Chicago River. 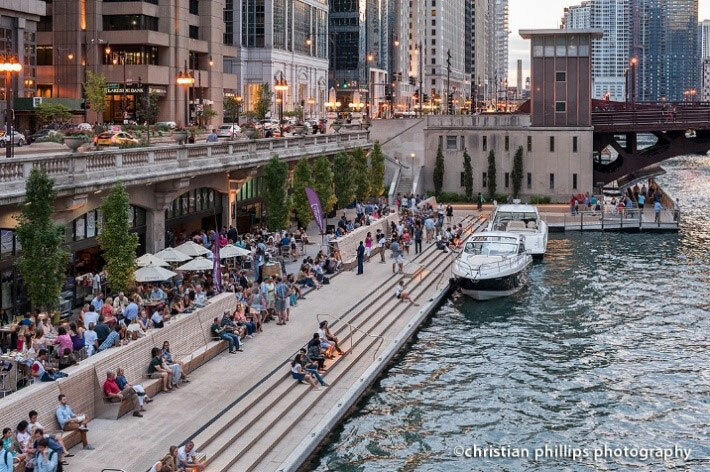 The Chicago Riverwalk is a connection between nature and the hustle and bustle of urban life, with many innovative infrastructure design and construction elements. Between the historically significant bascule bridges along the Chicago River, the extensive utility network running beneath Chicago’s streets and river, and the desire for an aesthetic and complimentary design – the Chicago Riverwalk faced many challenges throughout design and construction. What we are rewarded with today are unique gathering spaces that enhance community life in downtown Chicago. CDOT Deputy Commissioner/Chief Engineer of the Division of Engineering Dan Burke, S.E., P.E. is a true public servant and has worked over 20 years to improve not only the infrastructure within the City of Chicago but also the quality of life for the city’s residents. As Chief Engineer, Dan leads and manages the Engineering division which includes Bridges, Highways, Transit, Electrical Design, Quality Assurance and Construction Management Sections. Northwestern University Querrey Simpson Biomedical Research Center – Earth Retention System — The Earth Retention System for the Simpson and Querrey Biomedical Research Center at the Northwestern Medical campus covers a footprint of approximately 44,000 square feet and a maximum depth of 60 feet below existing sidewalk grade. The flexible system comprised of steel sheeting, internal bracing and tiebacks performed per specifications to limit ground movements, support unbalanced earth pressures and minimize impact on neighboring streets and utilities. Village of Northbrook – Wescott Park Stormwater Storage Facility — The Wescott Park Stormwater Storage Facility project was one of the Village of Northbrook’s most prominent stormwater projects to date, and the largest of the 31 projects included in the Village’s Master Stormwater Management Plan. The project innovatively combined stormwater design with green infrastructure to meet the Village’s flood protection goals while also reducing domestic water usage. Illinois Tollway – I-90 Fox River Bridge | Sustainability in Civil Engineering — The Fox River Bridge replacement project is one of the largest single contract awards in the $2.5 billion Jane Addams Memorial Tollway (I-90) Rebuilding and Widening Project. Each day, more than 100,000 vehicles cross the new 1,315-foot-long, eight-lane twin bridge. The combination of a novel bridge-under-bridge design with a gantry system for beam erection resolved a plethora of complex construction requirements and allowed six lanes of traffic during construction. The bridge-under-bridge design permitted construction of the new bridge substructure underneath the existing bridge superstructure with no impact to the traffic above. The space-saving gantry system eliminated the need for a large crane to move beams and did not intrude on the rare forested fen habitat growing at the base of the bridge. The Student Outreach Committee collaborates with various ASCE Institutes and other organizations to coordinate volunteer opportunities to get civil engineers actively involved and inspire future young engineers. With a big push for STEM (Science Technology Engineering and Mathematics) during recent years, there has been an abundant amount of events to get involved. The Committee has helped volunteer at events including: the ASCE “Dream Big” Movie Premiere at the Museum of Science and Industry, Engineering Fest at the Chicago Architecture Foundation, and at local universities engaging with ASCE Student Chapters on professional career advice. Patrick Pechnick, P.E. has been committed to the engineering field and Illinois’ transportation infrastructure throughout his 34+ year career. Mr. Pechnick has had two careers: the first with the Illinois Department of Transportation (IDOT), District One in the public sector followed by his current tenure in the private sector. As Engineer of Program Development, he oversaw the planning and design of IDOT District One’s transportation investments. He participated in all major transportation corridor improvements in the Chicago region over a 20+ year span. In his role as Area Manager responsible for the operations of a three-state area: Illinois, Indiana and Michigan, his focus on mentoring younger engineers and supporting professional associations such as ASCE has created a positive culture of career development and industry leadership. Tina Revzin, S.E., P.E., is a motivated and talented bridge engineer whose volunteer efforts with the ASCE Younger Member Group and WTS showcase her dedication to our industry. Her passion for mentoring young engineers, knowledge of structural engineering, attention to detail, and leadership traits, have earned her the respect of her peers and managers. Matt Brolley, P.E. is an Engineer with V3, Mayor of Montgomery, Ill., and Candidate for U.S. Congress. As Mayor, he is committed to leading with his civil engineering expertise in working with the staff and village board to develop and fund long-term infrastructure improvement plans and alternatives for the future water supply. Jacobs Engineering is one of the largest and most diverse providers of engineering, construction and associated support services. Jacobs brings a significant Chicagoland presence and understanding, employing more than 400 people in the region, with 180 dedicated to infrastructure projects. Jacobs is very supportive of employees’ involvement in the industry and community through different organizations that promote diversity in the industry, mentor the next generations of engineers, provide educational advancement of their members, and volunteer to give back to their communities.